Here's what I believe: Crisis on Infinite Earths did more harm than good. I'll try not to go all Jerry Maguire. I'm a huge fan of Marv Wolfman and George Perez. At the time when Marvel was doing amazing things with writer Chris Claremont and artist John Byrne's Uncanny X-Men, DC relaunched the Teen Titans as The New Teen Titans, with writer Wolfman and artist Perez. Both are incredibly talented, but I have to admit that I followed George Perez's artwork a lot closer. 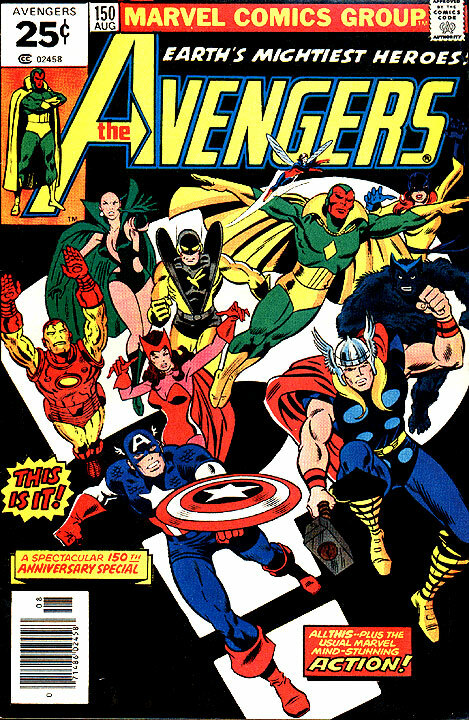 One of the early comic books I'd read was his The Avengers 150. He spent a few years on The Avengers, part of classic line-up that included The Beast (Hank McCoy one of the original X-Men), Captain America, Iron Man, Ms. Marvel, Quicksilver and the Scarlet Witch, Thor, The Vision, The Wasp and Yellow Jacket and Wonder Man (the leisure suit version). Then he moved "across the street", as we say in broadcasting, on for a very short run on DC's Justice League of America. The New Teen Titans debuted in September 1980. By 1982, Wolfman and Perez were laying seeds and Easter eggs for Crisis on Infinite Earths. The Monitor made his first appearance in New Teen Titans 21, in the summer of '82. Now, the whole point of Crisis on Infinite Earths was to address "continuity". Putting all of the stories and characters in order. 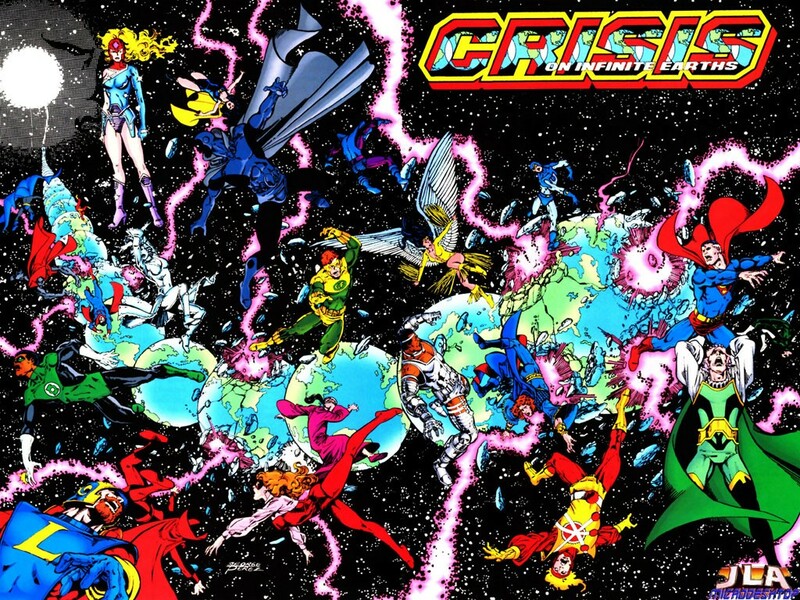 DC had amassed a huge number of characters and created several "parallel worlds". One of the most memorable events was the annual fall team-up between the Golden-Age Justice Society of America on Earth-2, and the Silver-Age Justice League of America on Eath-1. Earth-2 and the JSA had been designated as every thing that had happened up to and prior to Showcase 4. Earth-1, and the Silver Age started in 1956. For many years there were two Flashes, Jay Garrick and Barry Allen; two Green Lanterns, Alan Scott and Hal Jordan; two Hawkmen, Carter Hall and Katar Hol; and, two Atoms, Al Pratt and Ray Palmer. Even more confusing was that there were two nearly-identical sets of Superman, Batman and Wonder Woman. Several other parallel worlds were created, like the one for the Shazam! Captain Marvel Family characters that DC acquired from Quality Comics. DC had also acquired the Charlton Heroes including Blue Beetle, Captain Atom, Peacemaker and The Question, among others. The trick was to create a universe where all of these characters could co-exist at the same time. One of the elements of the story was a conflict between matter and anti-matter. This allowed for sweeping changes and a quick elimination of characters and worlds as they were "erased" from existence by anti-matter. They disappeared into nothing, and ceased to exist. I believe that this was the first time in comics history that a "hit" list or "death" list had been employed on such a wide scale. Editors and writers looked at the DC line of characters and decided which should be eliminated. Characters were created just to be eliminated in the twelve-issue storyline, that crossed over into every one of the DC comic books at the time. This was an epic, seminal story. Unfortunately, there was no going back to a time before it. Comics were fun. For the most part the stories were self-contained to a single issue or two. Very rarely was a story longer than a few issues, or did it crossover with another title. Characters were pretty well contained in DC comics. Marvel was more open about sharing characters. But, for the most part, DC was more strict. Batman appeared in Batman titles, World's Finest, The Brave and the Bold and Justice League of America. Villains very rarely crossed over from one title to another to face different heroes. What Crisis introduced was the life-or-death struggle to save the universe, not just the world or some small part of it. Stories had been about catching the bad guy and saving the girl. Now the very universe itself hung in the balance. What Crisis also introduced was a shift in publishing. Until 1985, DC just had one simple annual event, the JSA-JLA two-issue team-up. 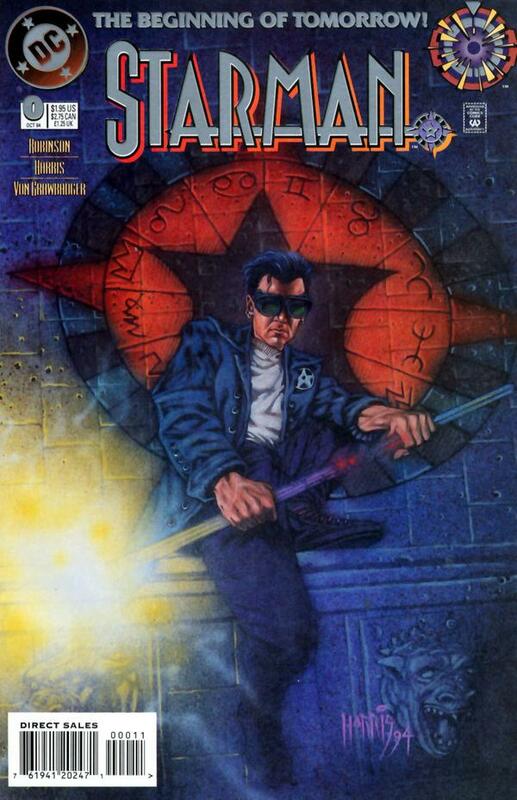 Post-Crisis, there has been an increase in "event" style publishing; stories that unfold over several issues and tie-in to other comic book titles. One event seems to tumble into the next event. The "sticker-price" of investing in any given current "event" published by either DC or Marvel is staggering. Any way you look at it the stakes have been raised all the way around. As far as story and price. As a comic book fan, I enjoy a good read. Comic books are a unique form of entertainment. They are unlike movies, plays, or television programs. The only thing that comes close if video games or sports. I lost interest in sports when I started to suspect that athletes were playing more than just the love of the game. Video games have only been a temporary interest. The only thing closer is to say that reading a comic book is like reading a chapter of a novel. A very long novel. Since I've become a dad - I have two boys now; Ethan (12) and Justin (11) - and a girl, Masha (13) on the way. My boys are very active in sports, so, I started looking at my comic book collection and what I'm going to re-read. Actually, what I'm going to have the free time to re-read. I haven't found a story that I've liked since 1985 as much as I've liked James Robinson's Starman. There are a few other comic book series that come close to it. Around the same time, I enjoyed reading Bendis' Ultimate Spider-Man and The Batman Adventures. The Justice twelve-issue series by Alex Ross and Jim Krueger is something I enjoy re-reading frequently. John Byrne's Superman & Batman: Generations is an enjoyable re-read. the twelve-issue series of that had it's pros and cons. I look at events like Secret Invasion, Civil War, Trinity, Infinity Gauntlet, Legends and Crisis on Infinite Earths, and I wonder how it's possible to re-read them, As a trade paperback, probably. Certainly not as individual issues. What was once much easier, is now proving to be a challenge. I think I am finally finding my own taste. I think I'm developing my opinion. I'll be happy to share it from time to time. Thanks. These two recent blogs are just me attempting to define what I mean by Earth-Dave.